The Wind Stone is located on the western shore of Harstrad River. 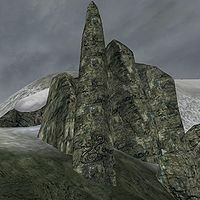 The spire is east of the Moesring Mountains, southwest of Skaal Village, near the Y where the Hastrad joins the Isild River. It is one of the six All-Maker Stones sacred to the Skaal. The Ritual of the Winds: Free the Winds from the Greedy Man's bag. This location makes an appearance in the Dragonborn expansion to Skyrim. This page was last modified on 21 September 2013, at 02:03.